If proof were needed that the routine talk of four years' planning for the next World Cup is invariably overstated, it comes in the form of James Taylor, whose assured batting display in the previous ODI in Colombo has suddenly made him the favourite to bat in the key No. 3 position for England in the tournament, but who only got an opportunity because Alastair Cook was suspended for a match for England's slow over rate. However much the coaches and selectors yearn for it to be so, cricket sides are not yet planned like the Soviet economy of old. Sri Lanka will also wonder if their own plans might yet go awry, particularly in the case of the opening batsman, Kusal Perera, who badly needs a score. At 3-1 up with three to play they can afford to be magnanimous. But their World Cup preparations have been boosted by the immediate return of Sachitra Senanayake, the suspended offspinner, now cleared to bowl again. Warming up for the World Cup with a seven-match series in Sri Lanka has given both sides ample opportunity to hone their approach, but it is here in Kandy over the next two games that conditions might have just a hint of New Zealand about them - give or take 15C anyway. As long as the rain stays away, it could be a highly influential few days. That Kusal Perera potentially offers potency at the top of the order is undeniable, but his recent returns have been meagre. He has only one half-century in 16 ODIs and in half of those innings he has failed to reach double figures. Since his run out in the opening match, he has been picked off by three England bowlers in turn: Finn, Woakes and Moeen. An average below 24 suggests he needs a substantial response soon. 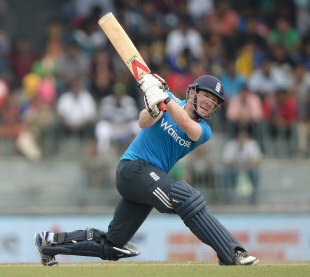 England were relieved to see Eoin Morgan end a lean run in the fourth ODI in Colombo. It was suggested by the coach, Peter Moores, that a temporary elevation to the captaincy might be the catalyst he needed and he proved it, hitting 62 from 47 balls, his highest score for 17 innings. But now the captaincy has been restored to Alastair Cook, with no sense that Morgan will get it back for the World Cup, and he must find his inspiration elsewhere. Seamers rarely dominate in Sri Lanka, but if they feel power flooding into their body anywhere it is in the Kandyan hills. That being so, Suranga Lakmal, who has not figured since an ODI at The Oval in May, may get an opportunity ahead of Jeevan Mendis, although the batting order would be weakened as a result. Kusal Perera will hope for another opportunity. Rangana Herath is likely to be out of the series with a hamstring injury and he has been replaced by Sachithra Senanayake, who could well walk in to the XI on Wednesday. Sri Lanka (probable): 1 Tillakaratne Dilshan, 2 Kusal Perera, 3 Kumar Sangakkara, 4 Mahela Jayawardene 5 Angelo Mathews (capt. ), 6 Lahiru Thirimanne, 7 Jeevan Mendis, 8 Thisara Perera, 9 Sachithra Senanayake, 10 Dhammika Prasad, 11 Ajantha Mendis. With James Taylor laying claim to the No 3 spot, and Alastair Cook returning from his one-match suspension, things do not look too promising for Alex Hales, who might be regarded as indispensable by the majority of the English public, but whose restricted range concerns the coaching staff. It is hard to see how Ben Stokes can survive such an unimpressive series - he seems from afar to have been affected by the heat more than most - which leaves England a choice between the spin of James Tredwell or the seam of Harry Gurney. Somehow Colombo and Hambantota have emerged unscathed from the late stages of monsoon, but the threat is even greater in Kandy, especially as this encounter is a day-night affair. If the rain relents, the pitch might give a bit of assistance to the seamers, especially under lights. "It's great to see guys come in and play like that, it's very refreshing, he's proved himself in domestic cricket for a long time now and for him to do it on the international stage will give him a lot of confidence." Joe Root describes the impact made by James Taylor. "Ajantha Mendis has had a tough role, which Lasith Malinga and Nuwan Kulasekara are used to doing. The responsibility of bowling after the 40th over often fell to Ajantha. He has been more expensive than some of the other bowlers, but he has also taken wickets throughout."